Dining at a Pattaya beachfront restaurant was one of the things I planned to do on my trip to Wong Amat beach and tonight was just going to be perfect. Because of the recent thunderstorm activity I took one of the hotel umbrellas for protection in case there was a repeat of the last two night's thunderstorms. 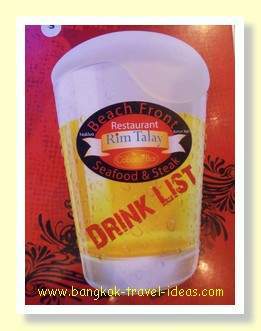 We walked down the Soi but went past the seafood place with the big flashing sign into a place called the Beachfront Restaurant Rim Talay, which not surprisingly was on the beachfront. 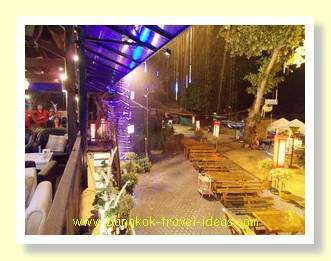 It was a prime example of a Pattaya Beachfront Restaurant with all the tables set out on the beach and little magic lanterns for lighting. We sat undercover, but near the edge of the balcony overlooking the sea and ordered some food and drink. They had a "special" on cocktails so we ordered a job lot that was equal to four drinks. I had always wondered why bars had not thought about doing this earlier as most of the cost in making a cocktail is in the labour involved in the mixing and shaking. So if you double the quantity mixed, your profit margin would be so much higher. Anyway here was a bar owner who was on my wavelength. The restaurant was not full and in fact it was not going to get any fuller that evening as the rain started about 9:00pm. The restaurant staff ran quickly to the outdoor tables collecting all the cutlery and soft seating and getting it all undercover as fast as possible. One of the staff got out a 12 foot step-ladder, climbed up and started putting a plastic bag over one of the outdoor floodlights. Not only was his ladder at an angle, it was chucking it down with rain and there he was messing about close to electricity. Anyway that night he avoided toppling from the ladder or being electrocuted and lives to do it all again another day. The rain really started to come down heavily and we had to move our table back a bit further inside the restaurant as the wind was blowing some spray onto our table. I took some photos of the scene as the storm developed and even took some video that showed how hard the rain came down. The rain was nowhere near as heavy as on the first night that we spent in Pattaya, but it was still a decent example of a Pattaya thunderstorm. Fortunately after about an hour the rain started to subside. It was still raining when we walked back to the hotel and so it was lucky that I had taken the umbrella with us. Continue reading my Thailand Travel Diary about my visit to Pattaya, by following the link below. 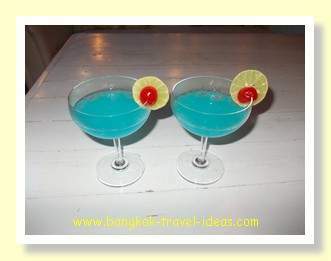 Learn what to do and where to go when you visit Pattaya or Wong Amat Beach.